This morning, Pacoima celebrated the city of Los Angeles’ newest protected bike lanes on Van Nuys Blvd. The Van Nuys parking-protected bike lane extends 0.8-miles from Laurel Canyon Boulevard to San Fernando Road. This is the city’s fourth protected bike lane facility, and the first in a predominantly low-income Latino community. This morning L.A. Mayor Eric Garcetti, LADOT General Manager Seleta Reynolds, community leaders, and city staff celebrated the recently installed bike lanes in a ceremony at Pacoima Neighborhood City Hall. 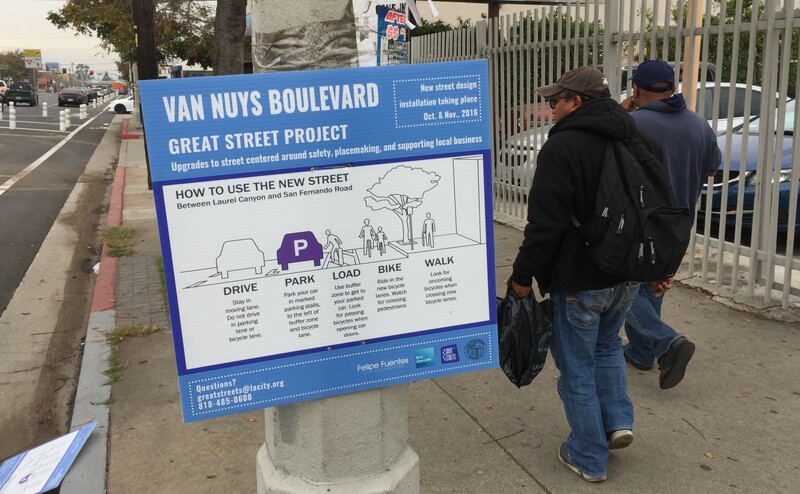 The Van Nuys Blvd Safety Improvement Project was workshopped in April and finalized consensus designs were announced in May. The new street configuration will reduce corridor speeding that has contributed to crashes resulting in death and injury. The boulevard received an asymmetric road diet, removing a single northbound lane to add two bike lanes. The southbound bike lane is fully parking-protected, with the positions of the bike lane and the parked cars switched. There are merge zones at intersections, with no specialized bike signals or floating transit islands, as L.A. debuted on Los Angeles Street downtown. The northbound bike lane is not protected, but includes a narrow striped buffer. 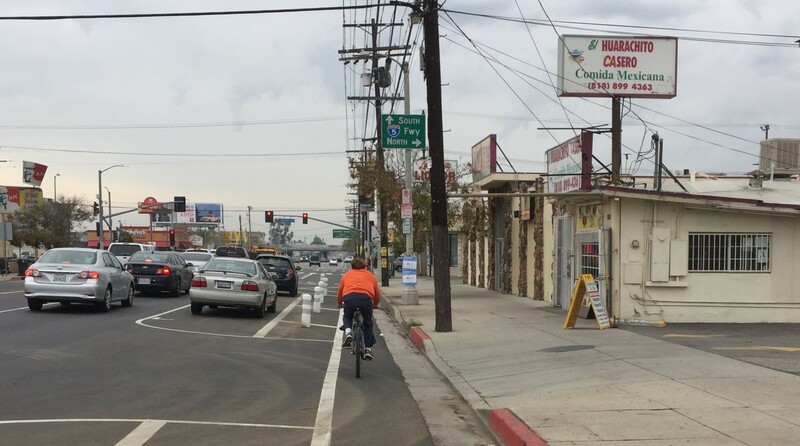 The southbound bike lane on Van Nuys Boulevard is now parking-protected. All photos: Joe Linton/Streetsblog L.A. 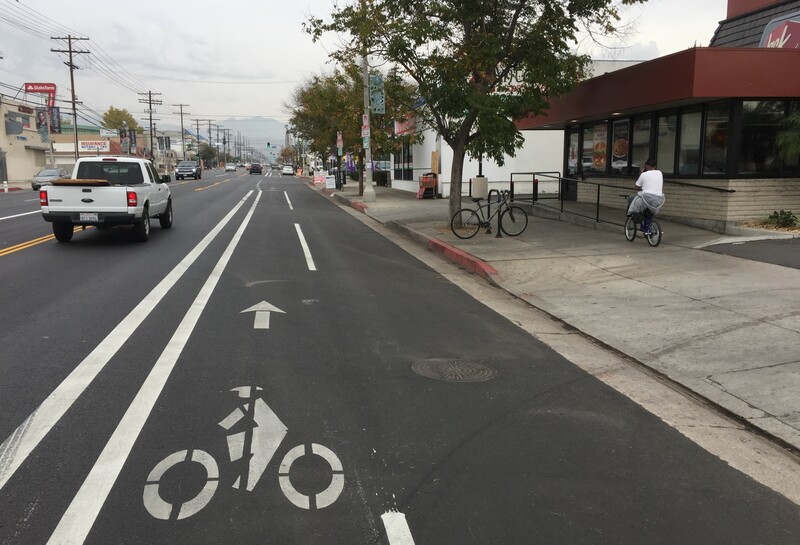 This stretch of Van Nuys is part of Garcetti’s Great Streets Initiative, which resulted in the city’s first parking-protected bike lanes on Reseda Boulvard in 2015 and more coming soon on Venice Boulevard in Mar Vista. Safety and the needs of cyclists being put over car throughput and speed? This is a pleasant surprise! I wonder if they considered a two-way cycle track on one side of the street…I think that would have been much better than 1 protected lane and 1 buffered lane. While Garcetti and Reynolds take the credit, let’s not forget this project is only possible because Councilmember Felipe Fuentes supported it before leaving in September. It should be interesting to see if this becomes a bikelash issue with the 20 candidates running for CD7 in March. Doesn’t the standard for protected bike lanes include green-colored potential conflict areas to increase their visibility for cyclists and drivers alike? I don’t see the green coloring here.